The MagNA Lyser instrument is a benchtop device that automatically disrupts cells or other biological materials. The instrument facilitates the production of a supernatant containing nucleic acids and proteins suitable for subsequent purification, extraction, or analysis. This instrument is optimized to extract DNA, RNA, or mRNA from different tissue sources. 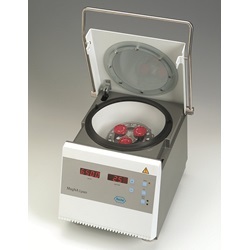 This instrument performs efficient homogenization of mammalian tissue, plant tissue, or other materials. A customized Rotor Cooling Block is included to efficiently cool samples during setup. Efficiently homogenize a wide variety of sample materials. Prevent nucleic acid degradation with the benchtop cooling block. Ease your setup and cleanup with a removable rotor and prefilled disposable vials. Homogenize up to 16 samples in just a few seconds. Save valuable lab space with a small benchtop instrument. Integrate your workflow with the automated nucleic acid isolation of the MagNA Pure 96, MagNA Pure LC 2.0, and the MagNA Pure Compact Systems. Perform consistent and reproducible sample disruption. 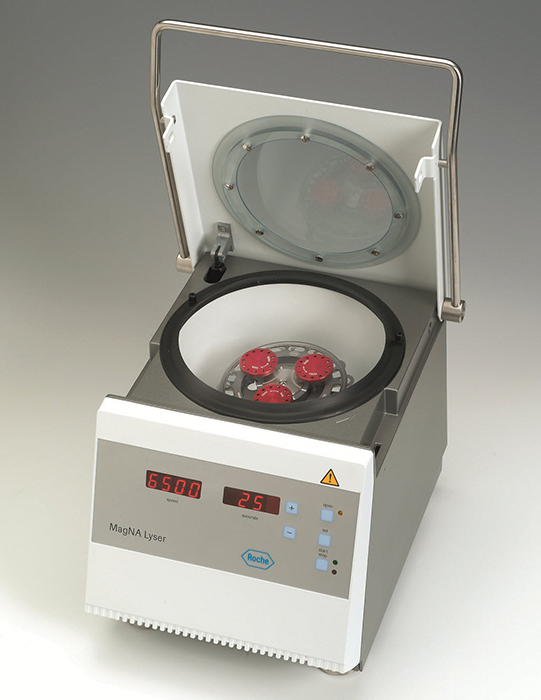 The MagNA Lyser Instrument contains a convenient removable rotor, which holds 16 sample tubes for simultaneous processing. The sample tubes are prefilled with ceramic beads (MagNA Lyser Green Beads); tissue and lysis reagents are added to the sample tubes. This instrument creates a rapid, oscillating reciprocal motion of the rotor, which agitates the contents of the sample tubes; tissue disruption is caused by the collision of the beads with the sample material. The cells in the sample tubes are disrupted nearly instantaneously when they collide with the ceramic and/or glass beads. The rate of collision and energy of impact (both of which determine the effectiveness of the disruption process) depend on the shaking speed of the instrument and the specific gravity of the beads. By varying both of these parameters, you can ensure optimal disruption of a wide variety of cells. The time of the run can also be varied to disrupt different types of tissue efficiently.